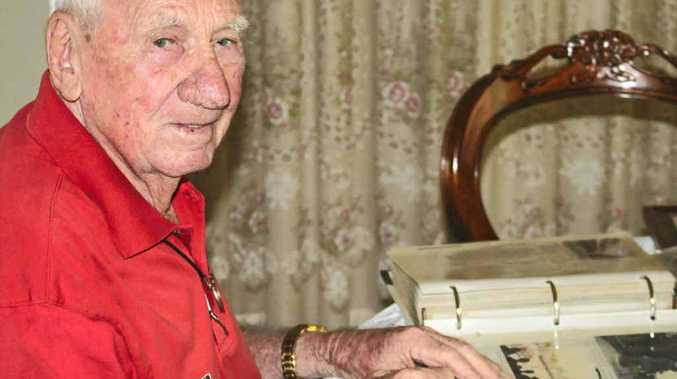 AT 91-years-old, Tom Phillips' memory is as sharp as his wit. Among a lifetime of war memories, the former soldier from Killarney has one particular story he loves to tell. "I was selected to go with the Australian Army to the coronation of the Queen," Mr Phillips said. "42 of us were selected to guard the Queen at Buckingham Palace on May 26." But it wasn't the pride or excitement of guarding the Queen that made Mr Phillips' the talk of the town in 1953. "I was one of two sergeants of the guards; I was in charge of change of the guard every hour or two," Mr Phillips said. "One day I went into the palace grounds and went to the back of the palace and it was there I saw the Queen." On this day, the Sydney Morning Herald described his experience with Her Majesty somewhat different than Mr Phillips remembered. The Sydney Morning Herald reported, "She wore a scarlet jacket with gold braid, a black full-length skirt and a black corn hat with tall plumes". But Mr Phillips said this was a romanticised version of the truth. "She was in ordinary khaki pants and a khaki shirt and was about to mount this horse, Winston," he said. "I did give her, as I describe, the best salute I have ever given. "She gave me the biggest smile," Mr Phillips said. For a soldier, the opportunity to guard the Queen is an honour, let alone be the recipient of a gracious greeting. Mr Phillips said this day stood as a highlight in his army career. "I was surprised and pleased too, it was a great moment for a soldier," he said. "She smiled at me, no one else was around." He recalled reporting back to his guard officer, explaining what had happened. "Then all day our phone was ringing in the guard house asking about what happened, including reporters," Mr Phillips said. A few days after his encounter with her Majesty, she was officially crowned. During the coronation period, soldiers from across the globe marched through the streets. "We marched 17 miles, it rained a bit, but was mostly fine," he said. "There were millions of people in the street and we were told it was the first time ever, Buckingham Palace guards had been applauded." When Mr Phillips left the army, he returned to Killarney and married his sweetheart Peggy Pullen and reared two sons. He will forever remember the day the Queen smiled at him.